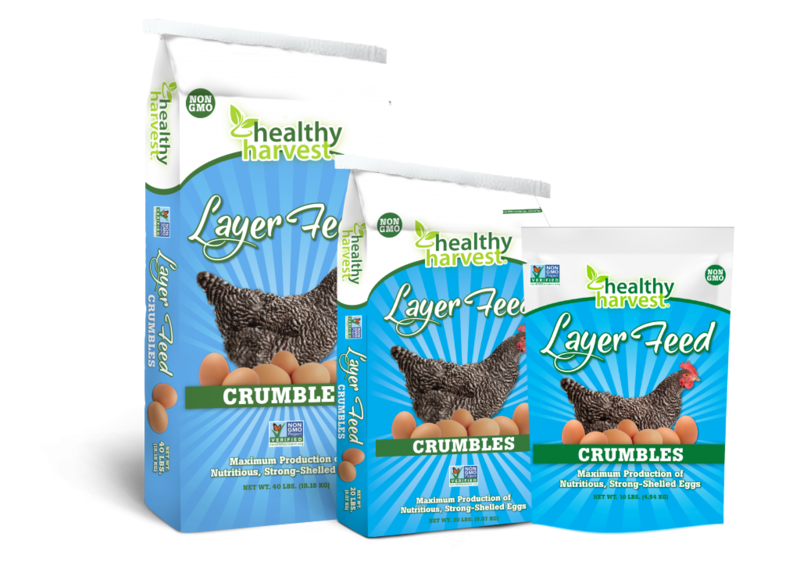 The healthy choice for your layers- made with Non-GMO grains and fortified with essential amino acids and top calcium levels to produce strong shells and wholesome, tasty eggs. Contains a proprietary blend of prebiotics, probiotics, and enzymes to support digestive, immune and health function. An all-natural, antibiotic free, Non-GMO Project Verified feed formulated with essential amino acids and top calcium levels to aid in the production of strong shells and tasty eggs. Corn, Soybean Meal, Ground Wheat, Wheat Middlings, Calcium Carbonate, Defluorinated Phosphate, Salt, Sodium Bicarbonate, DL-Methionine, DL-Methionine Hydroxy Analogue, L-Lysine, Choline Chloride, Vitamin A Supplement, Vitamin E Supplement, Vitamin D3 Supplement, Niacin, Vitamin B12 Supplement, Riboflavin, d-Calcium Pantothenate, Menadione Dimethylpyrimidinol Bisulfate (Source of Vitamin K activity), Biotin, Folic Acid, Thiamine Mononitrate, Pyridoxine Hydrochloride, Zinc Amino Acid Complex, Manganese Amino Acid Complex, Copper Amino Acid Complex, Cobalt Glucoheptonate, Zinc Sulfate, Ferrous Sulfate, Manganese Sulfate, Copper Sulfate, Ethylenediamine Dihydriodide, Cobalt Sulfate, Sodium Selenite, Dried Trichoderma reesei Fermentation Extract, Dried Penicillium funiculosum Fermentation Solubles, Spray Dried Hydrolyzed Saccharomyces cerevisiae Yeast Product, Lactobacillus acidophilusFermentation Product Dehydrated, Lactobacillus casei Fermentation Product Dehydrated, Enterococcus faecium Fermentation Product Dehydrated, Bifidobacterium thermophilum Fermentation Product Dehydrated, Capsicum annuum Extract, and Tagetes erecta Extract.